Fire in the hole! 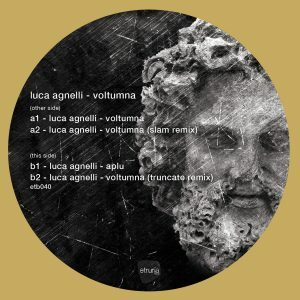 Luca Agnelli’s Etruria Beat hits its 40th release and it’s a truly historic affair with two very top remixers : Slam and Truncate! Now seven years deep into the label’s innovative techno trip, Etruria has made nurturing exciting new Italian talent one of its key signatures. Bastinov, Dast, Reform, Kaiser, Diego Amura and Toms Due are just some of the progressive creators Etruria have supported over the last two years alone. But for this release it’s down to the label bossman himself… And he’s made sure it’s a deeply Etruscan affair. ‘Voltumna’ pays homage to the supreme god of Etruscan people. Not just in name and honour, but also in its powerful dynamic and touching balance of shades thanks to its atmospheric, rhythmic chord. ‘Aplu’ continues this spiritual theme with a dedication to another Entruscan divinity. An offering to the god of thunder and lightning, once again it lives up to its name with a barbed rolling dynamic that suddenly cracks open into a cosmos of light and emotion before hurling you back into the dark drum drama. Thunderous isn’t the half of it. It comes complete with two exceptional remixes of ‘Voltumna’ by Slam and Truncate. Soma bosses Slam add their signature Glaswegian grit with distorted textures that loop in a hypnotic frenzy while Truncate strips the groove back to a jacking dynamic that becomes progressively bouncier with raw machine funk insistency. Across the originals and remixes there’s not a corner in techno that isn’t exceptionally explored here; this is by far one of the biggest and most heartfelt releases Luca has given the world to date. Do not sleep on this one.